Granger, DA, et al. (2007). Salivary α-Amylase in Biobehavioral Research. . Annals of the New York Academy of Sciences, 1098:, 122–144. .
Gordis EB, Granger DA. (2006). Asymmetry between salivary cortisol and alpha-amylase reactivity to stress: relation to aggressive behavior in adolescents. Psychoneuroendocrinology, 31(8):, 976-87..
Zahran S et al. (2015). Stress and telomere shortening among central Indian conservation refugees. 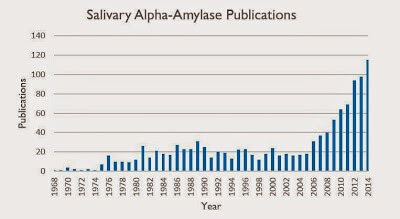 Proc Natl Acad Sci, 112(9):, E928-36..
For information on the Salimetrics Salivary Alpha Amylase Assay click here.